Huckabee wins Iowa with Evangelical vote. Huckabees huge victory among Evangelical Christians just further alienates me from the Republican Party (for which I am currently a member, although I do not know for how much longer). As a Christian myself, I refuse to go along with the one issue politics of Huckabee and Evangelicals. Huckabee is not on par with many core beliefs of Republicans (myself included) and my own experience with Evangelicals both in general and politically has shown them to be very hypocritical “Sunday Christians”, which I have discussed in other blog; “My Thoughts”. I agree with Huckabee as to abortion and Creationism, however even here I a leery of him as even the I oppose abortion in principle, I know many good Christians that have been alienated due to the stigma attached to a decision to have an abortion and his approach seems to be rather hard line here (I could be wrong). The same goes for creationism as even though I have never scientifically “bought” into evolution, even long before becoming a Christian, I still believe in all views being taught and although I believe Huckabees position is similar, I again somewhat leery of him here based on his rhetoric. Back to Huckabee’s other views and history, I find them rather socialist (not that all my views are right wing either), but from his view on National Defense (where I think he is rather “hide your head in the sand” about) to domestic issues I have part ways. Also the Evangelical disdain of Romney simply because of his Mormon faith further disgusts me. This is interesting as Mormon growth in Massachusetts stagnated during his tenure there as Governor, so much for using his power as a governor or president as a bully pulpit. 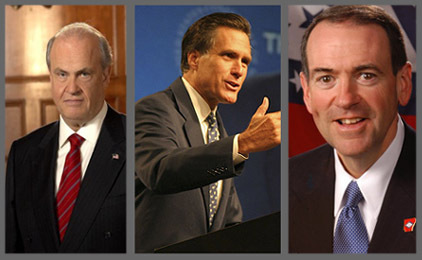 I hope that either Thompson or Romney can prove Iowa wrong, if Huckabee wins the nomination, I am NOT voting Republican (which I am not on my local candidates anyway, see an earlier post in this blog as to one reason: “Oregon Food Stamps”). Speaking of this issue (Food Stamps), some may say I am looking for a hand out here, far from this, I just want politicians to stand up for what is right and just and NOT give out hand outs to those un-willing to work for them. I work 80 + hours per week and am the primary caregiver in my home as well and only expect help from the government as to what they have promised, not to mention the $1000s of tax dollars I have contributed over the years, never even tapping any government “freebies”.